Explore the “dark side” using bulb exposure mode. When taking a picture, the shutter stays open for up to 10 seconds while the shutter button is depressed. This helps capture light even when it’s dark, so bright objects will appear despite a dark background. If you’re looking to capture a starry night, this is the perfect mode for shooting star magic. 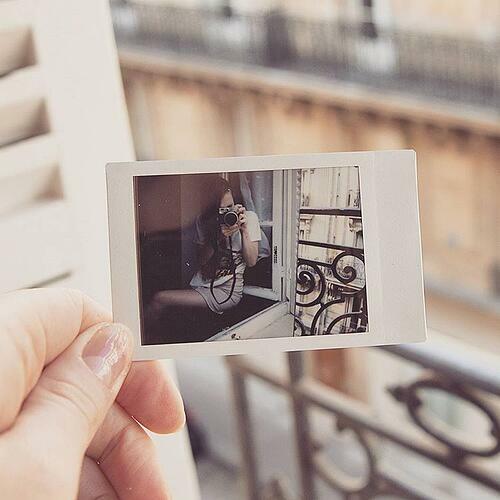 For your best images, try placing your instax on a stable surface. Have you ever wondered how two images would look combined into one? Wonder no more with double exposure mode. New to the instax mini 90, this mode superimposes different images into one photo by releasing the shutter once for one scene and again for another. The possibilities with this mode are endless — have overlapping images, or create silly trick photos to make your audience look twice. For a seamless background, use a tripod or flat surface. Be the life of the party with party mode, which brightens up a background while keeping the focus on the subjects that are front and centre. This mode makes it easier to recall locations by brightening up the backgrounds. In party mode, the flash is adjusted according to the brightness in the room. Fast-moving subjects like kids or pets can be difficult to film, which makes kids mode the perfect way to never miss out on special moments. With a faster shutter speed than in normal mode, blurring is decreased for a clearer, sharper image despite movement. This mode is most effective in low light conditions, such as a cloudy day. Capture beautiful scenery with landscape mode, which sharpens a subject that is 3 metres or more away. This mode is designed to focus on as much of a scene as possible from a distance. Our high-performance flash mode automatically calculates the surrounding amount of light and adjusts the shutter speed accordingly. This mode is featured on our mini 50S camera, and is perfect for photos in dimly lit venues. Take the ultimate selfie with self-timer mode! The timer allows you to be in the picture with friends or family by creating two photos with one press of the shutter. You’ll know the timer is activated when the orange lamp appears, giving you time to strike a pose. Take stunning close-ups with macro mode, which brings a subject 30 to 60 centimetres away into sharp focus. The minimum focusing distance is 30 centimetres, but the sharpest images are taken at 40 to 60 centimetres from the subject. Different instax camera and printer models have different modes – explore which modes yours has and get creative!